A day after anti-Islam protesters marched in record numbers in Dresden, German Chancellor Angela Merkel said her government would do everything in its power to fight intolerance, calling discrimination based on religious faith “humanly reprehensible”. Roughly 25,000 demonstrators, some carrying mocking posters of Merkel in a headscarf, marched in Dresden on Monday, to demand stricter immigration rules and an end to multiculturalism in Germany, home to 4 million Muslims, most of Turkish origin. The movement, called PEGIDA or Patriotic Europeans Against the Islamisation of the West, has drawn far fewer supporters in other cities. And counter-demonstrations against racism have drawn far larger crowds throughout the country, including 30,000, in Leipzig, and 20,000, in Munich, on Monday (12 January). But the backlash against immigrants represents a major challenge for Merkel. Her conservative party includes a number of prominent Islam sceptics. And members of a new right-wing party, the Alternative for Germany (AfD), have allied with PEGIDA in criticising her for allowing in too many immigrants and asylum seekers. 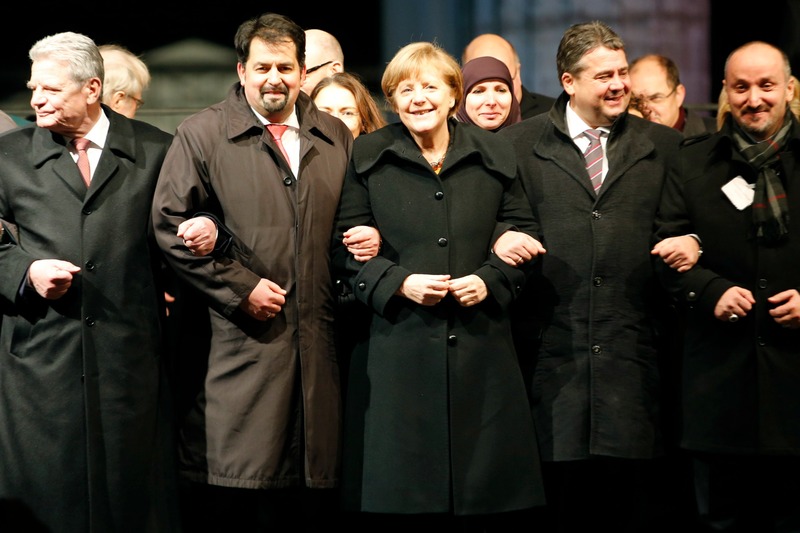 Speaking in Berlin, Merkel delivered one of her strongest repudiations of the PEGIDA movement and its sympathisers. “What we need to do now is to use all the means at our disposal … to combat intolerance and violence,” Merkel said. “To exclude groups of people because of their faith, this isn’t worthy of the free state in which we live. It isn’t compatible with our essential values. And its humanly reprehensible. Xenophobia, racism, extremism have no place here,” she added. Her message was echoed by President Joachim Gauck, who joined Merkel and religious leaders at a vigil for victims of last week’s attacks by Islamic extremists in Paris that killed 17 people. Declaring in French “I am Jewish, I am Muslim”, Aiman Mazyek, head of the German Council of Muslims, added: “We stand together for a Germany that is open to the world, with a big heart, which honours freedom of opinion, of the press and of religion.” Christian and Jewish leaders also spoke. A recent poll by the Bertelsmann Foundation showed 57 percent of non-Muslim Germans feel threatened by Islam. It was conducted before the attacks in Paris. On Monday, Merkel declared that Islam was a central part of modern German society, a comment that was plastered on the front pages of leading newspapers. But it drew criticism from a range of right-wing politicians, including members of Merkel’s CDU. With one of the lowest birth rates in Europe, Germany faces a demographic crisis over the coming decade and Merkel’s government is encouraging immigration to combat this. In 2013, Germany saw net immigration of 437,000 people, its highest level in 20 years. It also welcomed close to 200,000 asylum seekers last year, many from war-torn Syria. The nationalist movement also campaigns against numerous other phenomena: multiculturalism, against asylum applicants, Germany’s Russia-policy, and against the media. It has allied itself with populist party Alternative für Deutschland. PEGIDA's membership includes neo-Nazis, cultural conservatives, and football hooligans. German leaders line up with the people. Like they did after the Charlie Hebdo Rally?